Yes that’s a photo of no in flight entertainment (IFE) screen. Looks pretty strange right? 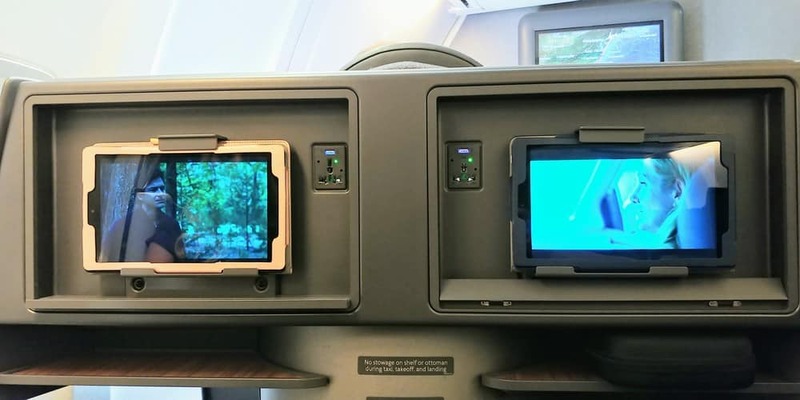 American Airlines is removing IFE from many of their seats because “More than 90 per cent of our passengers already bring a device or screen with them when they fly”. I sure hope you either bring your own tablet on your next AA flight, or book in business class where they provide one, otherwise it’s going to be a looooooong flight. This particular 757 aircraft did not have IFE screens, but luckily enough Jess and I brought our own tablets. That brings me to my next point, would you ever expect a “first class” flight to have no IFE? What’s a little confusing and some even might say misleading is that domestic first class is actually not true first class. It’s more similar to business class, and sometimes (usually) inferior to true business class on a three cabin aircraft. What is important to know is that when you are flying on a two cabin aircraft, the most forward cabin will be called either business class or first class, but no matter what it is called, you are getting the same thing! This domestic first is different than a true first class on a three cabin aircraft. 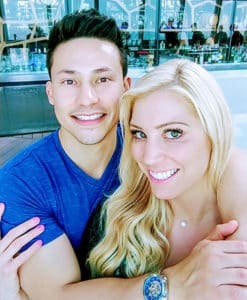 For a review of a true first class product (in pretty much every way possible) check out my previous review of Cathay Pacific First Class Los Angeles to Hong Kong. For the remainder of the post I may say business class, first class or domestic first class, and they all mean the same thing on this particular aircraft! To make things even more confusing, AA has two versions of the 757. An older version with only reclining seats, and a newer version with lie-flat seats. We were lucky enough to have the newer version with lie-flat seats. This flight from New York to Miami was the second flight of our three leg journey. The cost of the flights (mainly due to the transcon first class flight) would have been over $4000! This meant getting over 4 cents/point of value. Not too bad for AA miles these days. If you are asking why we flew through JFK to get to Miami and why fly to Curacao when our main destination was Bonaire, make sure to check out my previous post on the AA 321T Transcon Flight. Bonaire has been on our bucket list since we started scuba diving several years ago. While there is only one small international airport on Bonaire (BON), both Aruba and Curacao islands are nearby and each have their own (also small) international airports (AUA) (CUR). Together the three islands make up the ABC islands of the caribbean. When searching for award flights it’s always good to be flexible (both in dates and flight routes) and creative. Since we had a limited number of dates to choose from, we had to be flexible with flight routes and airports. American Airlines did not have saver award availability to Bonaire, but did have open saver availability to Curacao. We took this as a chance to fly into Curacao and explore all three ABC islands! 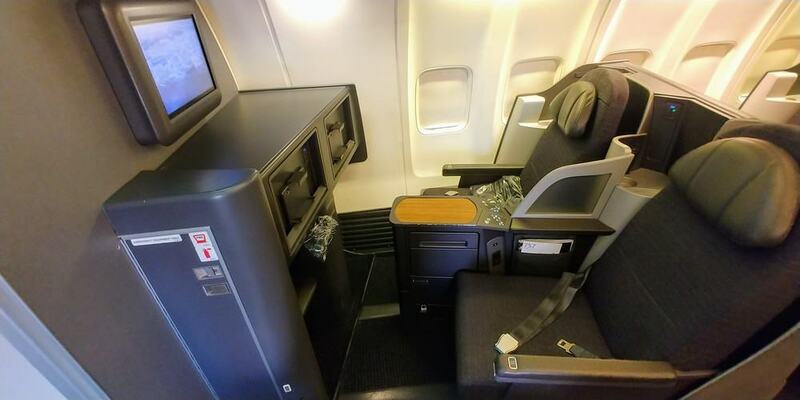 I had also been wanting to try out AA’s transcon first class flight from Los Angeles to New York ever since we experienced business class on that route earlier this month. I was especially looking forward to the Flagship First Dining. There are only four airports in the US that have AA Flagship Lounges, and our routing took us to three of them! There was no saver availability from either of those three islands back to LAX, so we ended up using United Airlines miles for the return flight. The 757-200 has two classes of service. The first class cabin has four rows in a 2-2 configuration for a total of 16 first class seats. The arrangement and seats are very similar to the A321T business class, however there are only four rows on the 757 and there are five on the 321T. The main cabin has a total of 52 main cabin extra seats and 108 main cabin economy seats. The first class cabin 2-2 configuration is great when traveling with a companion because you can sit directly next to each other. If you are a solo traveler, these business class seats may not be as preferable as they offer less privacy and the window seat does not offer direct aisle access. Each first class/business class seat on the B757 has 58 inches of pitch and 21 inches of width. 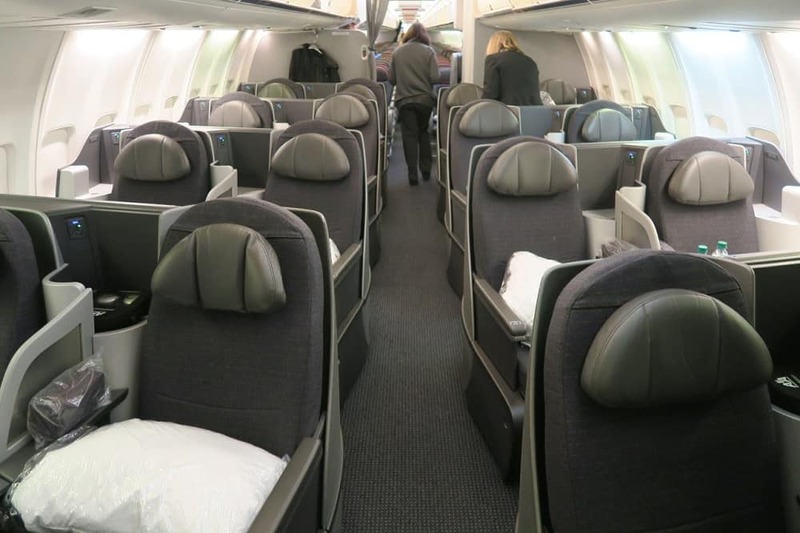 The seats are similar to the seats on the AA 321T transcon business class I reviewed several weeks ago. What is actually great about these seats on the Boeing 757 is that they are true lie-flat seats! This is not always the case for many domestic first class routes. While it was a short 3.5 hour flight from New York to Miami, the lie flat seats were crucial to catch a few more hours of sleep after our red eye flight to JFK. The seats were comfortable enough for sitting, reclining and catching a few hours of sleep. 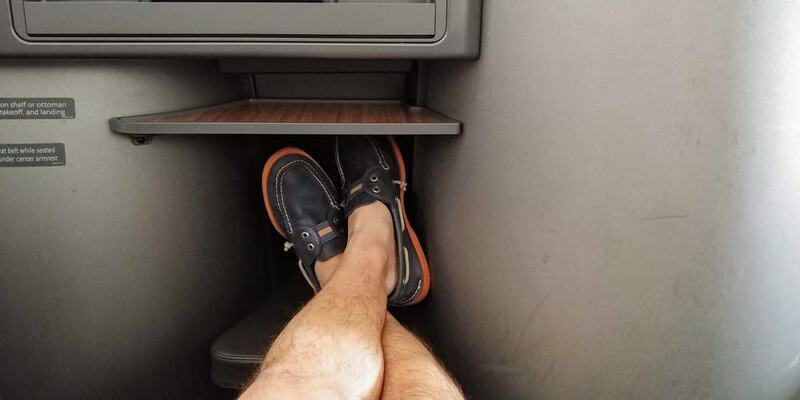 The foot cubby was a little cramped even for my modestly sized 10 Sperrys. I can imagine some passengers would have a tight fit. Speaking of the IFE, there was none. First class passengers were provided with a tablet and bose headphones if desired. I did like how they added a tablet holder to put the tablets where the IFE screen would normally be. Jess and I used our own tablets and that ended up working out pretty well (with wireless headphones). 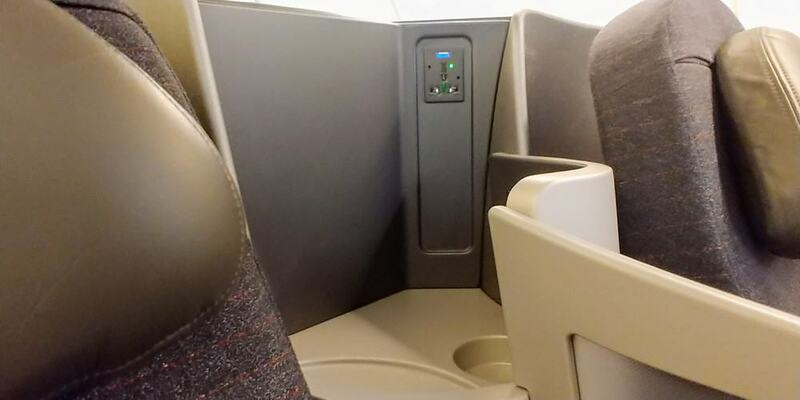 There were two charging ports, one in the storage area by the headrest and the other where the IFE monitor would be. I passed out for the entire flight. Literally zero words were spoken to the flight attendants so I can’t comment on this area. I was also so stuffed from last night’s multiple meals and the JFK Flagship Lounge I didn’t wake for the snack service. 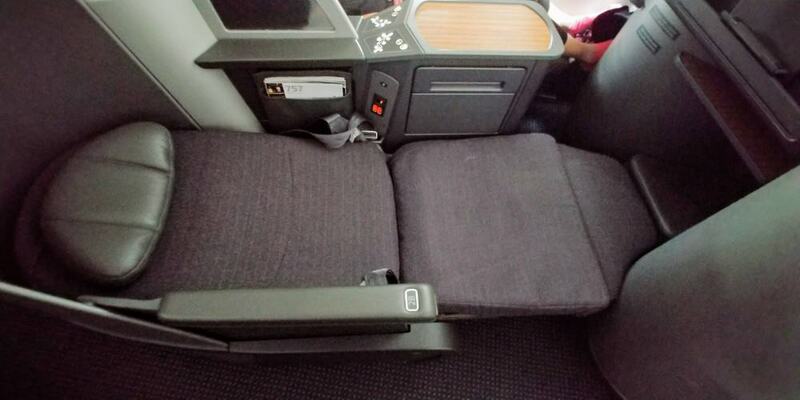 The new American Air 757 first class seat is perfectly comfortable for domestic flights. 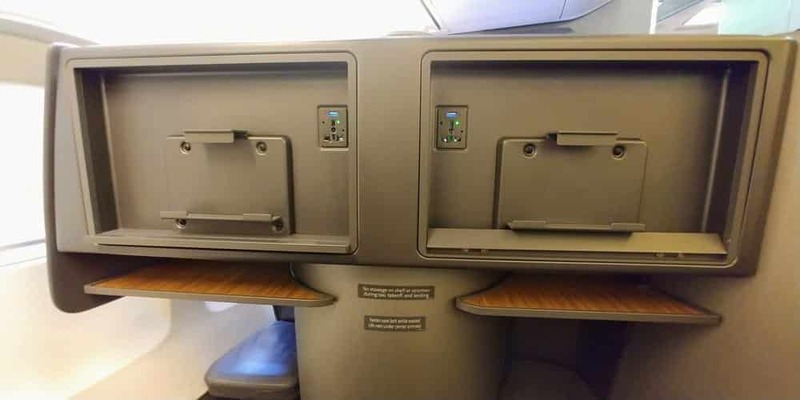 The newer version reviewed in this post actually has lie-flat seats, so if you are planning on getting some sleep make sure to check which version you are flying on! The lack of IFE was a little disappointing, but not a big deal on a 3 hour flight.